WHITLEY, England - July 12, 2016: Jaguar Land Rover has demonstrated a range of innovative research technologies that would allow a future autonomous car to drive itself over any surface or terrain. Tony Harper, Head of Research, Jaguar Land Rover, said: “Our all-terrain autonomy research isn’t just about the car driving itself on a motorway or in extreme off-road situations. It’s about helping both the driven and autonomous car make their way safely through any terrain or driving situation. “We don’t want to limit future highly automated and fully autonomous technologies to tarmac. When the driver turns off the road, we want this support and assistance to continue. In the future, if you enjoy the benefits of autonomous lane keeping on a motorway at the start of your journey, we want to ensure you can use this all the way to your destination, even if this is via a rough track or gravel road. SURFACE IDENTIFICATION AND 3D PATH SENSING research combines camera, ultrasonic, radar and LIDAR sensors to give the car a 360 degree view of the world around it, with sensors so advanced that the car could determine surface characteristics, down to the width of a tyre, even in rain and falling snow, to plan its route. 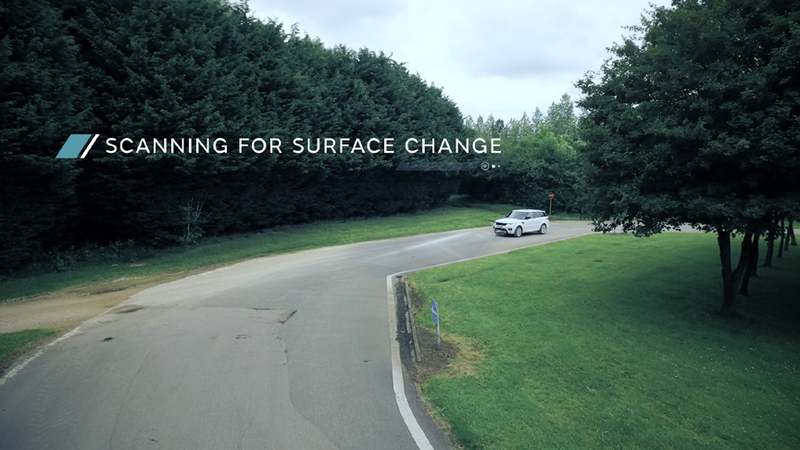 Ultrasonic sensors can identify surface conditions by scanning up to five metres ahead of the car, so Terrain Response settings could be automatically changed before the car drives from tarmac to snow, or from grass to sand. This will optimise all-terrain performance, without loss of momentum or control. To complete the 3D path, branches overhanging a track, or a car park overhead barrier would also need to be identified to determine if the route ahead is clear. OVERHEAD CLEARANCE ASSIST uses stereo camera technology to scan ahead for overhead obstructions. The driver programmes the system with the vehicle’s height, which can include roof boxes or bicycles, and the car will warn the driver with a simple message in the infotainment touchscreen if there is insufficient clearance. Sensors could also be used to scan the roughness of the road or track ahead and adjust vehicle speed. 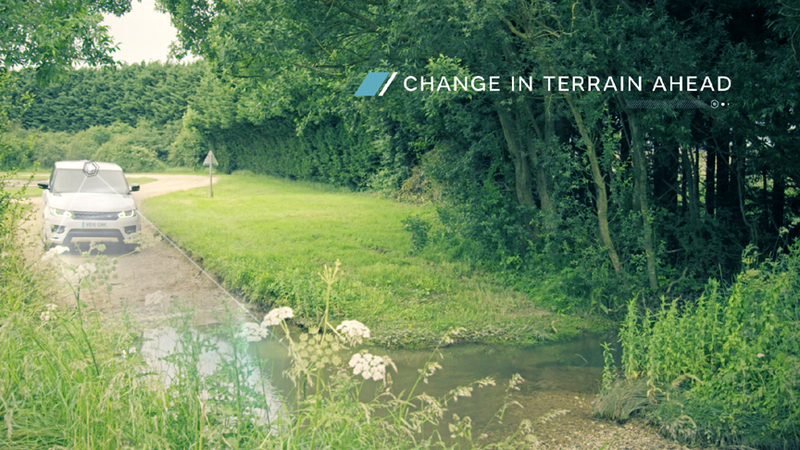 TERRAIN-BASED SPEED ADAPTION (TBSA) uses cameras to sense bumpy terrain including uneven and undulating surfaces and washboard roads, potholes and even standing water. It is then intelligent enough to predict the potential impact of these surfaces on the car’s ride and automatically adjust speed to keep passengers comfortable. Tony Harper said: “This V2V communications system can seamlessly link a convoy of vehicles in any off-road environment. If a vehicle has stopped, other vehicles in the convoy will be alerted – if the wheels of drop into a hole, or perhaps slip on a difficult boulder, this information is transmitted to all of the other vehicles. 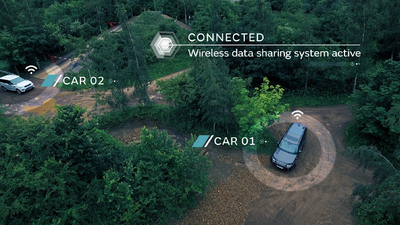 In the future, a convoy of autonomous vehicles would use this information to automatically adjust their settings or even change their route to help them tackle the obstacle.